The number of children referred for protective services, and of these, the proportion living with a parent or other caregiver with cognitive impairment, is increasing. 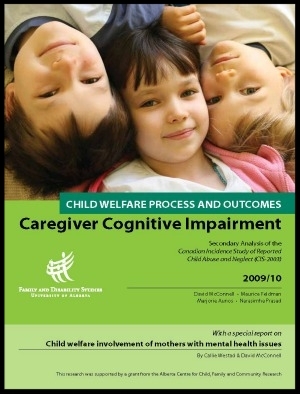 Building systems capacity to support parents with cognitive impairments and promote the health and well-being of their children is therefore essential to containing the escalating human and economic costs of child maltreatment, protective services, and out-of-home care in Canada. The challenge at hand is turning rights and rhetoric into reality for parents with cognitive impairments and, in turn, promoting a healthy start to life for their children. Utilizing data from the second Canadian Incidence Study of Reported Child Abuse and Neglect (CIS_2003) we investigated prevalence and outcomes for children of parents (biological and other parents) with perceived cognitive impairments in cases opened for child maltreatment investigation in Canada. In a new study, we replicate and extend this analysis utilizing data from the third Canadian Incidence Study of Reported Child Abuse and Neglect (CIS_2008). The findings from this work continue to underscore the need for a planned and coordinated national strategy to build systems capacity to support parents with cognitive impairments and their children. A ‘broad-spectrum’ approach is needed. Equipping services with the knowledge, skills and mandate they need to deliver evidence-based parent training is crucial. However strategies are also needed to tackle discrimination, alleviate family poverty, strengthen the social ties of parents with cognitive impairments and in turn, improve the life chances of their children.